Over a week ago I posted, “Growing-up Fatherless: My Father’s Day Wish.” I decided to do this before Father’s Day because I wanted Father’s Day to be about what it should be about…honoring involved Fathers. Yesterday, I honored two most important Father Figures in my life, my paternal grandfather and my cousin who I lovingly refer to as Daddy. I enjoyed seeing other post of people with their fathers/father figures. I got sad at seeing statuses where people’s story was similar to mine. I became angry when I saw more memes telling women that the day isn’t their’s than women actually claiming the day. I became even angrier when rather than blaming deadbeat fathers for being deadbeats people blamed the mothers for choosing no good men. I calmed down and became re-agitated when I read, “Father’s Day Is Not For Single Mothers.” Then I got sad all over again and I realized that in this patriarchal society, no matter how far we’ve come women will always be last. Yes, it’s sometimes true. Women could have done a better job at choosing fathers for their children. The same can be said for men choosing mothers for their children. The big elephant in the room that many fail to discuss is that, some women prayed for a good mate. When who they thought was a good man came along they got married and had children only to later find out that he was a sheep in wolves clothing. Why does she have to take accountability for his inactions? Why do women have to continuously be blamed for everything? While I agree that single mothers need not ask for accolades on this day, I’m annoyed. I’m annoyed because rather than telling women that they don’t deserve to be honored on that day they should be telling these dead beat dads that they don’t deserve to be honored either. I find it amazing that any other day that we honor something, we have no qualms about calling out those that complicate the issue. Parent’s that don’t vaccinate their children are called out for the detriment they are causing society. Failing to protect yourself and your partner are addressed on World AIDS Day along with every other AIDS day. Cancer Awareness month we urge folks to get tested if not for themselves, for their families. Yet on Father’s Day or for that matter Mother’s Day we fail to address the negative issues and I am not talking about women claiming Father’s Day either. I saw more it’s not your day and don’t claim it than I saw women actually claiming it. I saw more post blaming these single mothers for their child’s father being deadbeat. As a child of a deadbeat father who continues to have children and a mother who gave her ALL for us and did not intentionally choose a jackass for our father. He lied and lied good. By the time she realized he had children it was too late. I know A LOT of women with that story. The reality is that sometimes people are just that good at showing their representatives. I mean REALLY GOOD!!! No they are not fathers. Yes they are doing it own their own. No they don’t deserve to be disrespected by comments such as the ones that I saw yesterday. 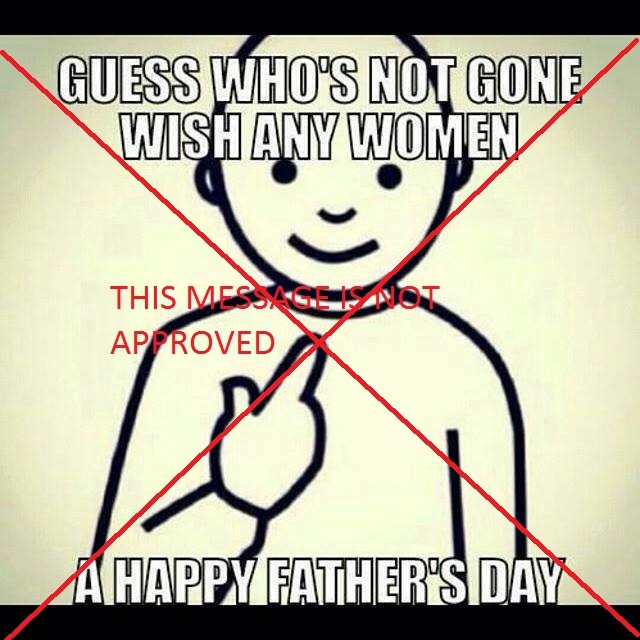 So here’s my thinking….on Father’s Day rather than reprimanding women for trying to take the day, reprimand the men who fail their children and put their children’s mothers in the single parent predicament. On Mother’s Day, the same is admonishment is fair. Quiet as it is kept, there are A LOT of father’s who share a child with a deadbeat mom. These women are not absolved from their failure. Nor are mothers who allow their bitterness over a dissolved relationship to get in the way of their child’s father from being involved. Both are despicable and deserve to be called out. How about the same men who admonish that women need not be acknowledged on Father’s Day applaud the women who in spite of relationship statuses go above and beyond to ensure that their child has a relationship with them. How about those men admonish the fathers who were invited to be a part of their children’s lives but continuously broke their heart by not showing up. This Father’s Day, I can count on one hand the amount of men who actually called out other men who fail their children. Who continue to fail their children. Who upon their death would’ve failed their children. Next Father’s Days and Mother’s Day let’s do better. Let’s place blame where blame belongs. Let’s do our part and speak out what really needs to be changed. Let’s continue to champion good parents on these days and speak-out against all those who sully title. Words of wisdom: If you are not a part of the solution, you are a part of the problem.